Bellropes01621 776445work Guest AccommodationBellropes, is a large, country house sitting on the southern bank of the Blackwater Estuary in Bradwell on Sea, Essex. It offers fantastic views over the river and is in a very quiet farmland setting in two acres of gardens with a large pond full of carp. Bellropes is on the Maldon Road a half a mile past the Bradwell on Sea sign, on the left hand side. Look for the sign and the fish at he entrance to the drive. Bradwell village is one mile down the road and has three country pubs that offer a good selection of local ales and fine food. We are also close by to Bradwell Marina, Bradwell Sailing Centre, Bradwell Power Station, Othona and The Chapel of St. Peter's-on-the-Wall. All rooms have tea and coffee making facilities and a television. Please call Carole for rates and availability. 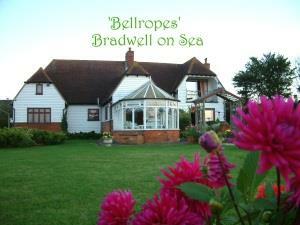 Bellropes, is a large, country house sitting on the southern bank of the Blackwater Estuary in Bradwell on Sea, Essex. It offers fantastic views over the river and is in a very quiet farmland setting in two acres of gardens with a large pond full of carp.